According to the dictionary, clutter is "A collection of things lying about in an untidy mass." That's pretty general. It also means that while some clutter needs to be purged (thrown out, donated, sold), some just needs to be cleaned up and put away. To break this down and make it easier for you to define which items in your home are clutter and which are not, here are six types of clutter to help you determine what to toss, keep and donate in your home. There's a saying that been attributed to Samuel Smiles, Isabella Beeton & Benjamin Franklin: "A place for everything, and everything in it's place." Simple, elegant & easy, right? Not always. Some of your clutter isn't really clutter, it's "stuff" without a home: mail you have yet to open, books you haven't put on your bookshelf (because your bookshelf is overflowing), or the beach chairs lying in a pile in the corner of your garage. It’s always easiest and most logical to store things a close to the place where you use them. If that’s not possible, store them as neatly and logically as possible. Labeled, clear plastic containers work for most items in your home, from toys to kitchen supplies to books to tech equipment not currently in use. This is the easiest type of clutter to banish. Some of the stuff you have lying around your home is just stuff you need to throw out. Expired foods, magazines, and newspapers you haven’t read, mail that needs to be sorted and actioned, and eyeglasses that you are never going to repair are all examples of this type of clutter. Having strict guidelines will also tell you how strongly you feel about getting rid of something. If you have a pair of pants that need to be hemmed and they’ve been waiting to go to the tailor or dry cleaners for over a month, maybe you don’t really need those pants anymore. Donate them. Can't resist a good sale? Is "free gift with purchase" too enticing to resist? You might be hoarding bargain clutter. Just because something was on sale, or even free, doesn't mean you need to bring it into your home. If you’re never going to wear that lipstick or use that moisturizer is it really a bargain? Same goes for tag sale and estate sales shopping (typically referred to as “thrifting”). Even if you get something for a bargain price, doesn’t mean it’s a good deal for you if you’re never going to wear it or use it. Watch out for bargain clutter at tag sales, antique shops, in gift bags and swag bags and at the mall during sales. Is stocking up your favorite weekend activity? Do you regularly buy new items in triplicate “just in case” you need it someday? You might be stocking up on abundance clutter if you keep large amounts of products around the house that go unused. Stocking up on items you know you’re going to use may be a good idea. Think bathroom supplies, toilet paper, paper towels, napkins, dish detergent, etc. But avoid “stocking up” on food, clothing, and decor. Your taste will change way too often to predict what you'll want to be eating and wearing months from now. Simply defined, this is the stuff you buy to try to appear a more interesting or skilled person. You might be trying to appear this way to other, or maybe you are just trying to appear more interesting to yourself. Regardless, these items are acquired not because you’re using them or love them but because of what they say about you. Think of a coffee table book you keep on display but have never sat down and read or the set of golf clubs you bought after one lesson that are now collecting dust. Aspirational clutter is the clutter we accumulate because we aspire to be different than who we really are. The best way to banish this type of clutter is to think before purchasing. Are you sure you want to take up skiing? If not, then rent your equipment first. Do you really love that coffee table book of rare birds or would you rather buy a book you’d actually read? Stop, think and pause before you buy. 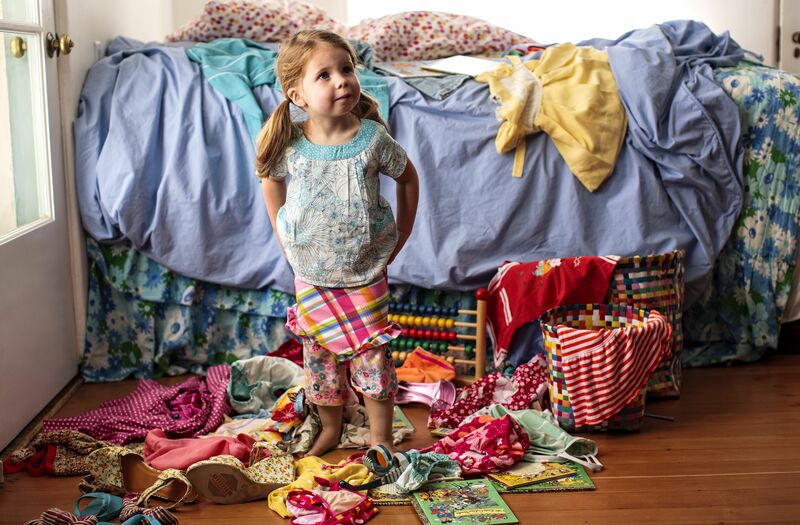 Are you afraid to throw out your baby blanket? If so, you might be holding onto sentimental clutter. Sentimental clutter is the hardest clutter to get rid of because you may feel like you’re betraying a loved one or your own fond memories of times gone by. There are methods to help you part amicably with your sentimental clutter. They include choosing just a few items to hold onto as mementos, getting rid of guilt and donation.